Coaching is in my blood. Before I decided to become a strength & conditioning or “performance” coach, I thought I was going to be a basketball or volleyball coach when I grew up. I remember as a teen watching the same recorded games time and again on old VHS tapes, breaking down mechanics, movement, and plays. I got my start in coaching back in 1996, when I was the assistant coach for a 14 and under girls volleyball team. And it just so happens that girls volleyball team was coached by Steve Shondell (arguably one of the best volleyball coaches in the state of Indiana), and they won the national championship that year. So yeah, they were pretty good! But since then I’ve had the honor and privilege of coaching female athletes of all shapes and sizes, ages and abilities. Today’s article is an overview of my thoughts on training female athletes. Along the way, I’m going to have to make some generalizations. You can’t take 50% of the population and not make a few assumptions. But I ask you not to hold that against me. My only goal here today is to give some thoughts and feedback on coaching the female athlete, and that hopefully my experiences can help you as well. I’m not sure I’ve ever had a female athlete I didn’t enjoy training. Well I’m sure I probably have, but none are coming to mind at this point in time! Let’s start by discussing lifting technique to start. For whatever reason, female athletes are really dialed in to the training process, and a big part of that is their listening skills. I think more importantly than their listening skills, though, is that females are by-and-large more detail oriented than males when it comes to technique. When I start coaching a young female athlete, I may show her how to squat and she will work painstakingly to improve her technique to make sure she’s doing things right. She doesn’t care about the weight on the bar as much as she wants to do things correctly. Males, fully strapped with that Y-chromosome, often feel they need to show how strong or awesome they are from the get go. So there’s the obvious benefit that women are quicker to dial in technique and do things right, but there’s obviously more to the coaching process than that. Kinesthetically (i.e. let them do it). In my experience, a greater portion of female athletes fall into the second category than the other two combined. And taking that a step further, these athletes also like to have verbal reinforcement before and after the set as to what they did well, so they can process that and improve upon it during the next set. Obviously you’ll need to find out what makes each individual athlete tick, but I think you’ll find that a lot of females react well to audible cuing, versus more visual or kinesthetic approaches. In my years of coaching females, I also find that there is a greater need for a personal or emotional connection with the coach than male athletes. I genuinely think some of the guys I’ve trained over the years liked me, but even if they didn’t, if I got them the results they wanted, they couldn’t have cared less. On the other hand, I can think of more than a few females I’ve trained over the years who didn’t really take their performance to the next level until they developed a personal connection with their coach. I respect all coaches, regardless of the tactics or approaches they use to get results. And furthermore, I’m willing to learn from anyone if they are a great coach and they get results. But at the end of the day, I’m a positive coach. I’ve had my share of “Negative Nancy” coaches in my athletic career, and while they might have understood the technical side, they never understood the mental or emotional side of the game. If someone is ragging on you or bringing you down, do you really want to exert maximal effort for that person? Or run through the proverbial wall? Instead, the coaches who always got the most out of me as an athlete were the ones who erred on the side of positivity. They knew when to push, but it was their style of pushing that made all the difference in the world. I see a litany of coaches today who berate and beat down their female athletes, and it drives me insane. They wonder why they can’t get through to this athlete, or why she’s not living up to her potential. Yet never look inwardly for the cause. While I’m positive with every single athlete I coach, I would say I’m even a bit more positive with my female athletes. I want them to enjoy training. I want them to build a connection with me, personally. But most importantly, I want them to feel good about what their doing in and out of the gym, because I believe that’s the key to long-term athletic success. You don’t need to wear your rose-colored glasses to work everyday. And I’m definitely not saying to give false praise when someone is sand bagging, or not doing what you want/need them to do. But a coaching personality that errs on the side of positivity versus negativity will take you a long way if you coach female athletes. We discussed up front how awesome females are about dialing in and refining technique. Well, sometimes this can be a blessing and a curse. In 2006 I was working as a strength coach for a local high school, and they had a really good girls basketball team. I worked with these girls twice a week year round, and one girl in particular really stood out. She was the best player on the team, and she had pretty darn good squat technique. But literally every time in the gym she was trying to squat with 75 pounds! Finally, I just stayed by her side the entire session, constantly pushing her to go up in weight. I think she finished with either 95 or 100 pounds that day, which equated to a 25-pound PR! When it comes to the gym, many females still harbor the thought of getting too big, or too bulky. Furthermore, most are so focused on technique that they never, ever, EVER want to bump the weights up, fearing that technique may break down. In this case, a good coach isn’t afraid to push them a little bit. Make sure they are striving for progressive overload, so they get more and more out of their training. While progressive overload is key, another critical factor is true strength and power training. If you’re training female athletes, please don’t shy away from the big lifts. 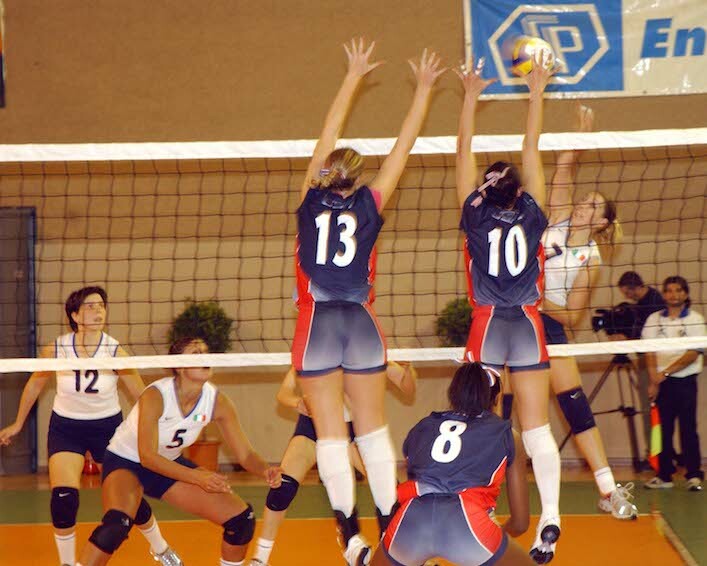 When I took over training our women’s volleyball team in 2001 at Ball State, these girls were doing a bunch of single-leg and split-stance work, but at no point in time were the actually pushing real weight. I came in, tested them, and found that they were horribly weak. These girls, elite athletes by all accounts, we’re only squatting about 1.1x their body weight. So even though we were in the midst of the competitive season, we made them start squatting twice per week. Except that within 3 weeks we put an average of one inch on their vertical jumps! The message is simple: Please don’t shy away from squatting and deadlifting with your female athletes. But taking that a step further, I’d also highly recommend working on power training. While strength training is huge, at some point, you have to convert that strength to power. Furthermore, a lot of female athletes have never been coached on power production or explosiveness. This is a huge, untapped resource. If you can teach a female to whip her arms quickly, or how to utilize her stretch-shortening cycle, you can make immediate and impactful changes in her explosiveness. This is something I’ve preached for years, but virtually every athlete we design programs for at IFAST needs more work for their core, hamstrings, and reaching muscles. The core is an obvious one – most athletes are locked in some degree of extension, so teaching them how to exhale and then use their core properly is a game changer for most. The hamstrings are also a critical piece of the equation. We know strong hamstrings are protective of the ACL, but they can also posteriorly tilt the pelvis (or more specifically, pull it back to neutral) so that normal hip motion is restored. And in the performance world, stronger hamstrings help you run faster and jump higher. Never a bad thing in my mind! Last but not least, we have reaching muscles. I used to describe this as “upper back,” but I’m changing my tune a bit here. What we tend to see in athletes, and especially in our female athletes, is a deep lumbar curve and then a flat upper back. Instead, I’m focused more now on exercises where the athlete is forced to reach, i.e. push-ups, landmine presses, and even overhead pressing. If we can teach our athletes to reach, we can restore proper positioning of the upper back, which will help keep not only the shoulders, but the lower back, hips and pelvis in a better position. Last but not least, I can tell you without reservation the female athletes I train have a greater desire to keep things fun then my guys. Look, we guys aren’t all that exciting. We can bang our head against the wall with squats, deadlifts and bench presses ’til the cows come home and not get too bored. But a lot of my females like to mix things up, even if it’s just a little bit. And if we can mix it up and have fun doing it? Even better. Now I’m sure there are a handful of women out there reading this that are seething right now, but again, this is just one man’s thoughts. If you can give a female athlete a training program that gets her results and that she enjoys doing, chances are you’re going to keep her around for the long haul. I’ve trained female athletes for over 15 years now, and needless to say, it’s a constantly evolving and ongoing process. I think I’m getting better all the time, but I also know this is one of those stories that never really ends. Not only is it a fantastic resource, but Molly is someone that I’ve personally mentored over the years, so I know the programming is legit. This week only, you can get the product on sale for $40 off the standard retail price, so if you’re interested please pick up your copy ASAP! 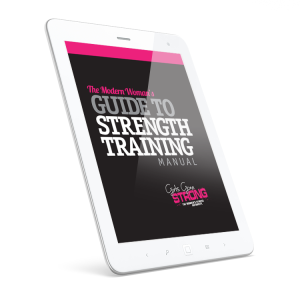 Purchase The Modern Women’s Guide to Strength Training and Save $40! I’m a woman. I think your assessment is accurate. I can’t tell you how many times I look at men in the gym with THE WORST technique and think “what are you doing?!?! ?” Conversely, any time I see a woman lifting, it’s always right on! So true! The women I work with tend to focus on getting technique as close to perfect as possible, whereas many of the males seem to think they can ignore it. Absolutely Lauren! Most women are at least in the ballpark, even if they’ve never been coached. Nice work Mike. Nice tip on using reaching in females training. Never given that much thought. You want to emphasize upward rotation of the scapula? Don’t just the ability to upwardly rotate the scapulae, but using the serratus to pull the rib cage BACK. Great post….and agree …modern woman’s guide to strength and conditioning from girls gone strong a great resource!